Our 5 year old frequently asks questions about the world, Australia and where we sit in relation to other countries. He will say "Can we drive to Canada to see Nanny & Poppy, Mum? ", "Can we go there on the weekend? ", "Is Sydney in Australia? ", "I really want to go to Bali with my cousins - can we visit them tomorrow? ", "We're learning to speak Italian at school - where is Italy, Mum?" ... and so on. To help him better understand the world and its vast expanse and that, no, you can't drive to Canada or just pop around to see his cousins in Bali, we bought him his very own world map. I designed them using Avery's Design & Print online program using their L7105 round labels. I then laminated the labels, again for durability and longevity, and cut them out. I attached the pins to the map using velcro dots, which I actually think I have a bit of a crush on. How super handy and versatile are they? I've added some spare pins to the side of the map using 3m hooks and bulldog clips - you know, just in case we get our "travel on" soon and need to add a stack more pins. Oh, those were the days. Now he can see for himself where Italy is. Little sister getting in on the action - placing Family in Argentina! Please excuse the rudey-tudey lamp shade. I sent my husband out for fire wood and that's what he came home with! 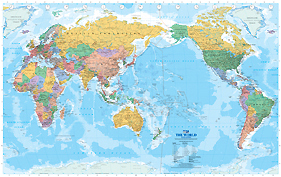 We all love the map and not only is it educational but it also adds a lovely, big-boy touch to our son's room and allows him to see at a glance where in the world he has been, where his family lives and where he might like to learn about or travel to one day (but not tomorrow). So, a fun little project that turned out exactly how I had envisaged (love that) although what I didn't count on was our son noticing just how close Bali actually is to Australia and now he REALLY, REALLY wants to go there! Oh dear, he's learning faster than I expected. If you're thinking of putting a map in your child's bedroom or in their playroom and you want to use my pins, please feel free - download away. You can either print them directly onto the L7105 round labels or just print them out on paper - up to you. And don't worry, the little black marks you see around the centre drawing do not print out. I have no idea what they are. Enjoy the world, and happy pinning! I love this Nikki. I have done something similar with the boys except it's covered in coloured wool. One colour for where we have been, one for where we are going and one for where the boys would like to go (with or without us!) I purchased maps from ezibuy and had their names put on them. They love it!